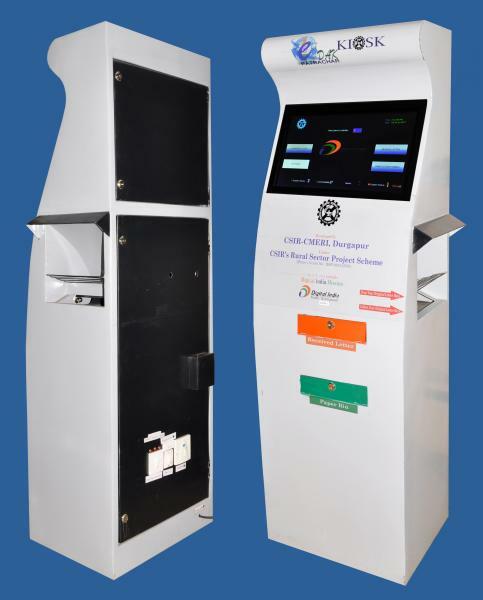 CSIR-CMERI technology e-Dak Kiosk is a self service, integrated communication kiosk system suitable for installation in public places, particularly in school, college, municipality, rural areas and villages. This kiosk system is perfectly customizable and can be used for any communication related application. Its robust, theft-prooff, vandal-resistant design makes it safer for placement at schools, collages, panchayat bhawans, block offices, gram sabha buildings, community centers and other such public places. The system is designed for easy maintenance and button free operation. Its makes it more suitable to be used by rural novice people. This system is designed to work with various channels of communications like 3G/4G data connectivity, broadband, LAN and WiFi. Major Equipments: Computing Panel, Touch Screen, Printing Panel etc.